White powder-puff like flowers appear in late spring on the current seasons growth. Flowers are pollinated by insects and birds. 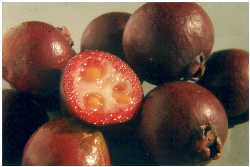 The red fruit about 2.5cm round, are sweet and tangy. The skin is deep red when ripe. The flesh is aromatic, juicy with small edible seeds. Habit - Smaller tree, can be moderately vigorous. Compact habit. Mature trees have attractive reddish-brown peeling bark. 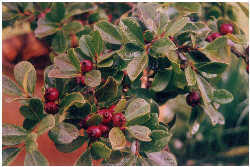 Glossy dark green leaves. Evergreen. New growth is reddish-bronze. 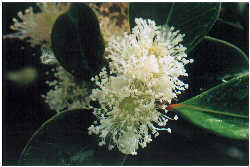 Size - Small tree from 2-4 metres. Harvest - Fruit is best picked when fully ripe. It should be fully coloured and slightly soft to touch. April through to June/July. White powder-puff like flowers appear in late spring on current seasons growth. Flowers are pollinated by insects and birds. 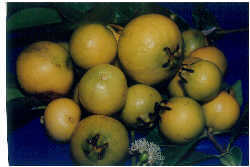 Yellow skinned fruit are larger, pale yellow with sweet flesh. The flesh is aromatic, juicy with small edible seeds. Habit - Smaller tree, can be moderately vigorous. Spreading habit. Mature trees have attractive reddish-brown peeling bark. Glossy green leaves. Evergreen. New growth is reddish-bronze.